Spring has definitely sprung, just in time for April. Even if it’s still a bit cold where you live, April sort of means that more sunshine and warmer weather are inevitable (right?! ), and in Wisconsin at least we can see the light at the end of the wintery tunnel. That being said, garlic is great during all seasons, and black garlic is no exception. It adds such wonderful flavor to summer dishes, and such depth to heavy winter stews and soups. And while we love coming home after work to the smell of our crockpot ready to serve us up some garlicky goodness for dinner, won’t it be fun to substitute warming crockpot meals for delicious fresh salads and vegetable dishes and grilled items! 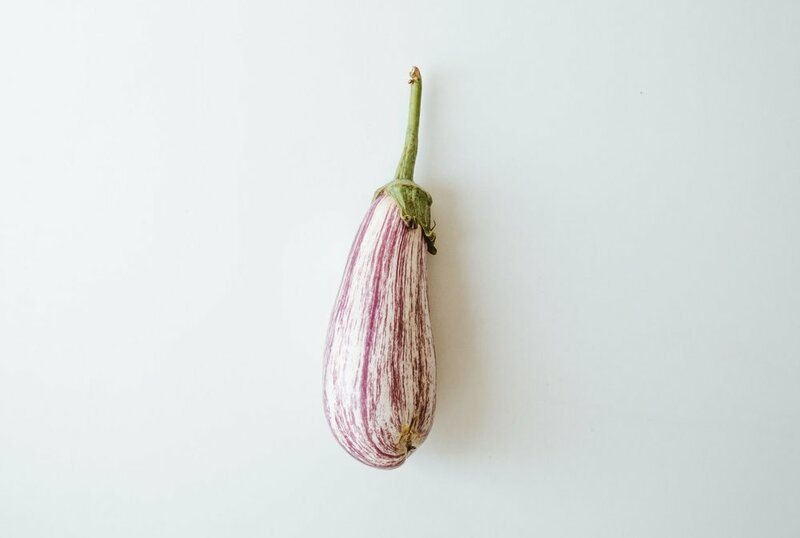 You have to love recipes that use just a ton of garlic, and this uses both black AND white garlic to give the eggplant an extra boost of flavor that will leave you wishing you had made a double batch. You can eat it on its own as a vegetable side dish, or top your favorite toast with it and bring it to work the next day. However you eat it, ENJOY IT! And happy sunshine and warm weather to you. Thanks to My Sun Coast in Florida for this amazing recipe. Preheat the oven to 250C/480F/gas 9 (or to its highest setting). Place the eggplant in a large bowl with half of the olive oil, 1½ teaspoons of salt and a good grind of black pepper. Mix well and spread out on 2 large baking trays lined with greaseproof paper. Roast in the oven until golden-brown and completely soft – about 30 minutes. Remove from the oven and set aside to cool. Place the black garlic cloves in the small bowl of a food processor with a third of a teaspoon of salt, 2 tablespoons of oil, 2 tablespoons of yogurt and the lemon juice. Blitz for a minute, to form a rough paste, and then transfer to a medium bowl. Mix through the rest of the yogurt and keep in the fridge until needed. Heat the remaining 110ml of oil in a small saucepan on a high heat. Add the garlic and chilli slices, reduce the heat to medium and fry for about 5 minutes, stirring from time to time, until the garlic is golden-brown and the chilli is crispy. Use a slotted spoon to transfer the garlic and chilli on to a kitchen paper-lined plate. Arrange the eggplant slices, overlapping, on a platter. Spoon the yogurt sauce on top, sprinkle over the chilli and garlic and finish with the herbs.